Halogenation involves the addition of halides, X2 (either Br2 or Cl2) across the double bond of alkenes, giving vicinal dihalides. Halogen addition works best with chlorine and bromine. The reaction of fluorine is too violent to be generally employed, and iodine addition is not normally favorable thermodynamically and often produces very low yields. But all of these reactions take place with a similar mechanism. Halogenations are best carried out at or below room temperature in inert halogenated solvents such as tetrachloromethane (CCl4, carbon tetrachloride). Halogen additions to double bonds may seem to be similar to hydrogenations. However, their mechanism is quite different, as revealed by stereochemistry of chlorination; similar arguments hold for the other halogens. The stereospecificity of chlorination reactions can be explored in a case where two new chirality centers are formed. Addition occurs in a way that places the two halogen atoms on opposite side (from both above and below) of the π bond. This mode of addition is called an anti addition. And the product is racemic. The chlorine-chlorine is subjected to heterolytic cleavage in the presence of nucleophile. 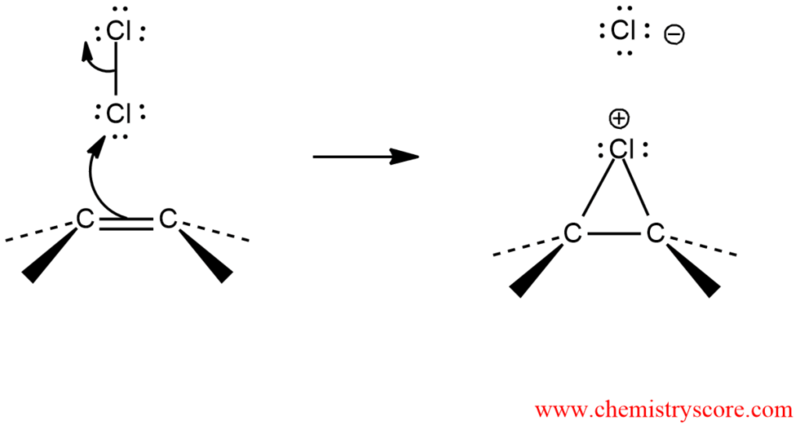 The π-electron cloud of the alkene is nucleophilic and attacks one end of the chlorine molecule, with simultaneous displacement of the second chlorine atom. And an intermediate cyclic chloronium ion is formed, in which the chlorine bridges both carbon atoms of the original double bond to form a three-membered ring. The structure of this ion is rigid, and it may be attacked by chlorine ion only on the side opposite the bridging chlorine atom. The ring opening reaction follows SN2 mechanism. In symmetrically-substituted alkenes attack is equally probable at either carbon atom, thereby giving the racemic (or meso) product observed.